It is well established that there is a functional columnar structure repeated throughout the cortex across species (the concept received significant attention after a study by Mountcastle in 1957 ; see  and  for reviews). 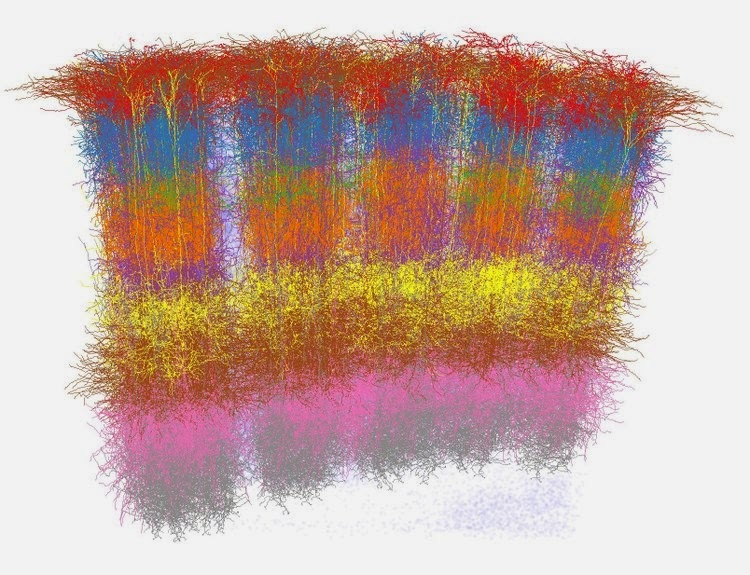 This suggests a universal cortical algorithm, which is fascinating if you are trying to understand the computational underpinnings of the mind from a biological perspective, or like us, to implement AI aided by learnings from neural principles. Assuming that there is in fact a universal cortical algorithm, we would like to define the column, and understand its function through first understanding how it is composed. It’s possible to find a columnar structure at multiple scales, which has produced a range of terms in the literature, from micro-column to mini-column, to macro and hyper-column. Many studies have approached it differently, leading to inconsistent definitions. It can be really confusing to switch between sources that make different assumptions. This has caused us to confuse ourselves as well, alternating between different internal definitions over time. The situation is beautifully expressed by Rakic in  below. See original paper for the quoted included citations. This quote is from an editorial in PNAS, where Rakic discusses a paper in that edition which disproves a long held belief that the anatomy of the cortex is uniform. This may appear to undermine the notion of a universal cortical algorithm, but it is focussed on anatomical features rather than the presence of functional columns. So we were very keen to clearly define a nomenclature consistent with the most accepted definitions, and stick to that. We discovered a paper by Rinkus from 2010 , which is part of a whole edition of Frontiers on the cortical column. It’s an excellent resource, highly recommended. There are many good papers, but I found Rinkus’ most useful for the best definition of cortical columns that I’ve read. That’s because it is nuanced, based on function, and part of an understanding (or at least proposal) of the algorithm of a region of neocortex. From this, we’ve created our canonical definition of mini and macro columns. To be published in the next blog post. Mountcastle, V. B., “The columnar organization of the neocortex”, Brain, vol. 120, no. 4, 1997. Horton, J. C., and Adams, D. L., “The cortical column: a structure without a function”, Philos. Trans. R. Soc. Lond., B, Biol. Sci, vol. 360, no. 1456, 2005. Mountcastle V.B., Davies P.W., Berman A.L., “Modality and topographic properties of single neurons of cat’s somatic sensory cortex”, J Neurophysiol, vol. 20, no. 4, 1957. Rakic P., “Confusing cortical columns”, Proceedings of the National Academy of Sciences, vol. 105, no. 34, 2008. Rinkus G.J., “A cortical sparse distributed coding model linking mini- and macrocolumn-scale functionality”, Frontiers in Neuroanatomy, vol. 4, no. 17, 2010.